Ye gods, wasn’t it ever an effort. The overriding impression that still sticks with me is of trying to read a book while sitting in a thick fog and being shouted at by a fat man in a cape. The opening scene, where Charles Grimaud’s life is threatened in deliberately oblique terms, seemed set in a room full of treacle that the characters were forced to wade through. Everything was laden with barely-disguised double meaning that already seemed like hard work. When we eventually got to his house to find he’d been shot by a stranger who had locked himself in Grimaud’s study and then vanished over snow-covered ground without so much as a footprint to show the way, things promised to pick up. But that be-caped fat man, wheezing and harrumphing and tapping his canes on the floor kept interrupting everyone and seemed intent on proving how bloody clever he was. After the demure elegance of Hercule Poirot and the beguiling worldliness of Jane Marple this idiot was hard to bear. Unfortunately his name was on the back cover, so I had a feeling I would have to hunker down at tolerate him as best I could. In my memory, I didn’t make it as far as the end of the first part – or ‘coffin’ as it is styled in the book – because eventually it just wore me down. I’m confident in this because when I picked it up again a couple of years later, having now read Hercule Poirot’s Christmas but still not really appreciating the essence of an impossible crime, I remember girding myself to get through no matter what and, upon reaching the end of the first coffin being suddenly struck by the line that concludes it (I shall not spoil it, but taken in context it is glorious). That single line of dialogue chilled me on account of the atmosphere Carr had created…and suddenly it all made sense. The scales peeled from my eyes, etc., etc., and unbelievably I went back to the start and read it all for a third time, but this time with that interim destination in mind. Everything fell (boom, boom) into place with a clarity that made it seem like a different book; I tore through it in a day, and loved every laden phrase and action. It wasn’t fog I was trying to read through, it was smoke, all the more effective in hiding the doubtless accompanying mirrors. It wasn’t treacle the characters were wading through, it was the weight of a shared history, of some horror behind them too great to simply be glossed over. Gideon Fell, that querulous genius, was simply frustrated that the tangible elements he could grasp were so invisible to other due to their panic-stricken refusal to see what was patently in front of them. And the palpable fear and confusion, the undercurrent of aching terror that wove its way through the background of events, was so hair-trigger fine that it crept deeper into you bones at each new revelation of this inexplicable murder, and rose to a screaming crescendo at the impossible death to come. Every page, almost every word, is part of a jigsaw of such deliberate design that you can’t appreciate it too closely – at this stage in his career, Carr didn’t have the turn of phrase that would propel him to unequalled peaks within the genre, he just wanted to beguile, confuse and astound you. He did. He still will, even over 80 years later. Its pedigree is hard to deny: it was rated as the greatest locked room of all time in a poll of experts in 1981, and there’s realistically nothing released since then that’s likely to usurp it (forthcoming Paul Halter translations notwithstanding). A more recent solely-Carr poll over at the fabulously informed Tipping My Fedora ranked it a not inconsiderable third place, which still makes it probably the third-best impossible crime ever written, and therefore it remains more than merely worthy of your consideration. Personally, I’m not sure it would make it into my top 5 Carrs any more, though that would take a lot of explaining, but it is a work of genius; uncompromising genius, no doubt, and not always easy to take, but absolutely a masterpiece of the highest order in how fully it achieves what it sets out to do. The Hollow has definitely been a book I have been wanting to read in its entirety, having only just read part of the The Locked Room Lecture chapter. 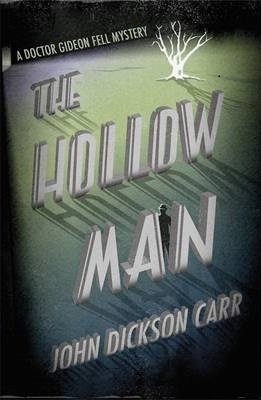 I’ll be interested to see which Carr novels you recommend later on this week as I don’t think any of the Carr or Carter Dickson novels I have read have ever knocked my socks off. The Emperor’s Snuff Box, She Died a Lady and The Skeleton in the Clock are probably the ones I enjoyed the most out of the ones I read but I feel like their probably not the strongest ones out of Carr’s whole repertoire. I don’t know if I’m necessarily recommending the strongest Carrs – possibly only one of them as they currently stand would be in my top five – so much as the five books that will introduce him as quickly and favourably as possible. A lot of his great work can often be buried under unusual turns of phrase or quite stifling atmosphere, and I’d argue you need to be innured to that before you’re necessarily going to get the most out of him. The “top five Carrs” list still has plenty more agonising over before it’s ready…! Oh, and She Died a Lady is a wonderful book.